People utilize geothermal energy to heat their homes and to produce electricity. This is achieved by digging deep wells and pumping the heated underground water or steam to the surface. But we can also use the stable temperatures near the surface of the earth to heat and cool buildings. Geothermal energy is making its presence felt worldwide and Iceland is the best example of the utilization of geothermal power. In fact Iceland leads the world in the development of geothermal utilization. They have doubled their annual power supply capping it up around 500 MW as far as electricity supply is concerned. Germany is also emerging as a major user of geothermal energy. Germany is deriving its 100 MW of heat from geothermal energy. Italy is not far behind. A team of European scientists, in the region of Travale (Italy), is planning to tap the potential of localized geothermal reservoirs. If this project is completed it will produce energy akin to a potential of around 1,000 wind power plants. This is one of the projects discussed at the international final conference of “I-GET” (Integrated Geophysical Exploration Technologies for deep fractured geothermal systems) in Potsdam. 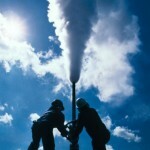 The European Union is also feeling the “heat” of geothermal energy. European nations are waking up to the potential of geothermal energy. This conference aimed at the development of state-of-the art technology with potential geothermal reservoirs. Seven European nations participated in this “I-GET” conference. They want to explore more and more geothermal reservoirs and utilize it for clean and green energy. The project “I-GET” could be a substantial step towards renewable energy source. The newly developed techniques have been tried at four European geothermal locations. They are combining different geological and thermo¬dynamic conditions. High-temperature reservoirs have been examined in Travale/Italien having metamorphic rocks and in Hengill/Island (volcanic rocks). They are also examining two deposits with medium-temperature in deep sediment rocks in Groß-Schönebeck/Germany and Skierniewice/Poland. The implications of the results of “I-GET” would be felt worldwide. Geothermal experts from Indonesia, New Zealand, Australia, Japan and the USA also participated in the “I-GET” project. There were 120 scientists and industry representatives from the 20 countries. “Reliable geothermal technologies are in demand worldwide. Even countries with a long experience in geothermal energy such as Indonesia and New Zealand are interested in the results acquired in I-GET,” says Dr. Ernst Huenges. Therefore, we hope that this “I-GET” will give the necessary push to the geothermal research. GFZ is currently establishing an International Centre for Geothermal Research, which will, focus on carrying out application-oriented large-scale projects on a national and international level.